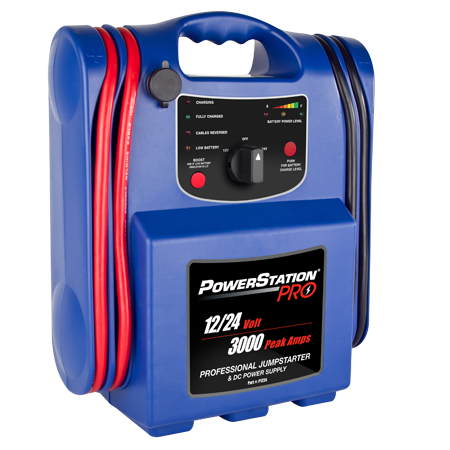 The PowerStation Pro P1224 has broken into the automotive aftermarket and emerged as the new standard for professional jumpstarters. 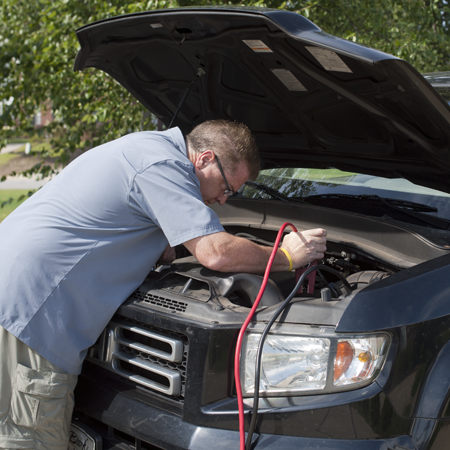 With 3000 Peak Amps of superior jumpstarting power, “no-spark” reverse polarity protection, 76” #2 AWG welding gauge copper cables, and 700A Nylon coated clamps, this model is an absolute must-have for the shop technician or weekend warrior searching for a user-friendly, incredibly powerful, and versatile unit to jumpstart a variety of vehicles ranging in size. The P1224 easily switches from powering a 12V battery system to powering a 24V battery system with the turn of a knob, and contains LED indicators highlighting the internal charge-status of the unit. The P1224 also has a 12V DC outlet with overload/short circuit protection so you can keep your accessories powered up while in the field, and comes with a 1A automatic charger.